WalterScottLibrary is a Legacy Library. Legacy libraries are the personal libraries of famous readers, entered by LibraryThing members from the Legacy Libraries group. » Sir Walter Scott's catalog. » Sir Walter Scott's legacy profile. WalterScottLibrary is also an author. 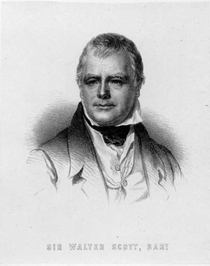 » See Sir Walter Scott's author page. About meI was a Scottish lawyer, magistrate, landowner, publisher, antiquary, literary scholar, translator, poet and novelist, who lived from 1771-1832. I gave up narrative verse after Byron cornered the market, and I am now chiefly remembered for my historical novels, the first of which was Waverley, published in 1814. The "Waverley novels" (so called because they were published anonymously "by the Author of Waverley") are generally regarded as the first historical novels in the modern sense of the term. Waverley was the first international best-seller of the industrial age, and is often regarded as the work that established the novel as the dominant literary form of the 19th and 20th centuries. About my library"The men who wrote these books," said Lambourne, looking round him, "little thought whose keeping they were to fall into." "Nor what yeoman service they were to to do me," quoth Anthony Foster: "the cook hath used them for scouring his pewter, and the groom hath had nought else to clean my boots with this many a month past." "And yet," said Lambourne, "I have been in cities where such commodities would have been deemed too good for such offices." If you would like to help with cataloguing my library in LT, please leave a comment below. -- Tracts on Covenanters &c.
-- Magic, Alchemy, Heraldry, &c.
The library is still in existence, and is being looked after by the Advocates Library in Edinburgh. See my WikiThing page for additional notes on this library.